Because I am unwilling to let go of Harry Potter just yet, I've been listening to the books on CD for the last couple of months' worth of commutes. I just started Harry Potter and the Half Blood Prince a couple of days ago, so it won't be long before I will be Potter-less. However, I'm not as upset about this prospect as I thought I would have been. You see, like a lot of people, I found the series engaging. I read the books multiple times. The same goes for the movies. Something's been different this time around, though. It's like I'm seeing the cracks in the facade. An example of this is that I've been a lot more aware of Madame Pince, Hogwart's librarian, and how she is described. I'm not sure why I'm more sensitive this time. Maybe it's the medium, after all audiobooks have a very different feel to them. Or perhaps I'm becoming more cynical as I get older, more curmudgeonly. Another possibility is that I didn't have my MLIS the first time I read the early books and wasn't quite as tuned into popular culture representations of librarians. Regardless of what happened before, I'm aware now. And the main thing of which I'm aware is that J. K. Rowling doesn't like librarians. Oh, sure, in Harry Potter and the Sorcerer's Stone, it is acknowledged that Harry, Ron, and Hermoine knew Madame Pince would be able to help them find the information they needed, but they didn't want her to know about what they were trying to learn. 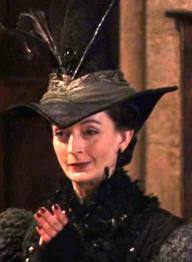 After that, though, Madame Pince is never mentioned without being shown as a harridan who is more concerned with the sanctity of her books than with anything else. She distrusts, and obviously dislikes, students. She even bewitches books to attack students when she catches them eating in the library. The school librarians I know now are accessible, intelligent, and fun. Same goes for the children's and teen librarians in my acquaintance. They all seem to care about their patrons more than anything else. Of course, I mostly know librarians in North America, so it could be that ocean between us and the UK makes a difference, but I doubt it. I'd really like to know what the librarians that Rowling knew as a child did do to her that made her portray us in such a poor light. What do you think? Outrageous overdue fees or an over-zealous shushing? If not those, then what? My first thought is that villains are more interesting than "good guys." Plus, it is socially acceptable to unfavorably portray librarians, so that makes for a doubly easier character to create. Madam Pince bothers me too, as does Jocastu Nu from Star Wars: Attack of the Clones. Unfortunately I did have an elementary school librarian whom I found scary and mean, and who didn't seem to like kids much. I know such librarians exist, but they're definitely the minority! Thankfully pop culture has provided some great, cool, smart librarians too. I definitely noticed Madam Pince more when rereading the series this spring/summer. I think you're probably right that getting an MLS makes you more sensitive to librarian stereotypes. It rubbed me the wrong way, but then I read somewhere that Rowling couldn't use a nice, helpful librarian because that would have made things too easy for Harry and friends.